Do you feel it? Is the competition getting more fierce? Especially the competition of utilizing inside resources or worse, to make no decision. How do you stand out from the crowd and get them to choose your solution? If you are like me you could use a few new ideas. Luckily, my good friend Lee Salz wrote an entire book on differentiation, where he shares 19 strategies to help you not only win more deals but at the price you want. Sales Differentiation: 19 Powerful Strategies to Win More Deals at the Prices You Want by Lee Salz will be a best seller. It’s full of ideas you can use immediately to move deals forward. One of the things I like is the design of the book. It’s easy to read and I like the concepts at the end of each chapter. Here’s the concept from chapter one. All the concepts are powerful but, WOW, imagine if you could position your solution so the buyer saw it as the best – game over! You and I both know we need to help our sales teams differentiate but what can marketing do to help? Who’s in Charge of Differentiation Around Here? In my sales process, marketing’s work should build brand awareness and develop interest. The message marketing puts out should attract the right audience and let them know your company exists and that your solution may be just what is needed. It gets their interest. And that is what the book is about. Setting a sales differentiation strategy for each buyer. Not for each company, for each buyer. What matters to one, may not matter to another. The seller has to be skilled at determining what matters to each buyer. Salz cautions against using the same pitch for all the buyers. Differentiation is individual. The way your solution will affect each of the buyers is different and they are each looking for what matters to them. When you fail to differentiate, deals stall, you have weak pipelines and salespeople resort to lowering the price to close the deal. This is not new news. Let’s prevent all that. Buyers only care about what they care about and it’s your job to figure that out and use the differentiators that matter. This is a great exercise and Salz gives examples in the book. Read the examples and then build your own. I mean it! Do it! 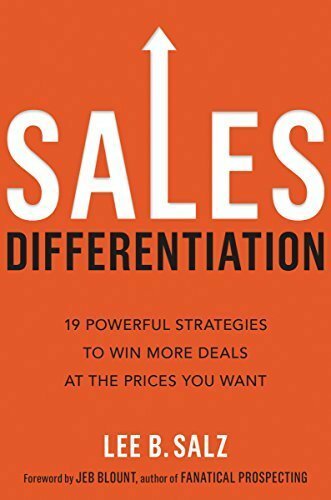 It is not enough to know your differentiators, you have to know how to use them and that is why I want you to read Sales Differentiation: 19 Powerful Strategies to Win More Deals at the Prices You Want by Lee Salz. I want your sales team to win more deals and not have to lower the price to do it. I love the way Salz ends the book. More than what you sell, the way you sell it, will always make a difference. You can be viewed as a salesperson or you can be viewed as a valuable resource. My advice, finish reading this and go buy Sales Differentiation right now.